Supercell’s first four games Hay Day, Clash of Clans, Boom Beach and Clash Royale have all made over $1 billion, according to the studio’s CEO Ilkka Paananen himself. Over the next nearly three years the company did the second thing it does best: it killed off numerous games that didn’t meet its uniquely high benchmarks. For a while it looked as though Brawl Stars would be the latest game not to make the cut. It soft-launched in Canada in June 2017 and proceeded to spend 544 days in soft launch until it finally got greenlit for global release on December 12th 2018. Key changes to the game’s monetisation, as well as moving from portrait to landscape mode, helped spur on the game to start reaching the heights expected of a Supercell game. But there were other important factors: the launch on Android to get more players involved - key to its multiplayer-focused nature - and its popularity in Eastern markets during soft-launch. Speaking last year at IronSource’s Gamefest event, Deconstructor of Fun founder and Rovio head of studio Michail Katkoff predicted that much of Brawl Stars success would come from the East. We dug into the soft launch stats on App Annie at the time and came to a similar conclusion. Now that Brawl Stars has been out for over three months and pre-registrations have opened for China, just how well is the game faring around the world? And could it stand to be the next big hit in the world's most lucrative games market? 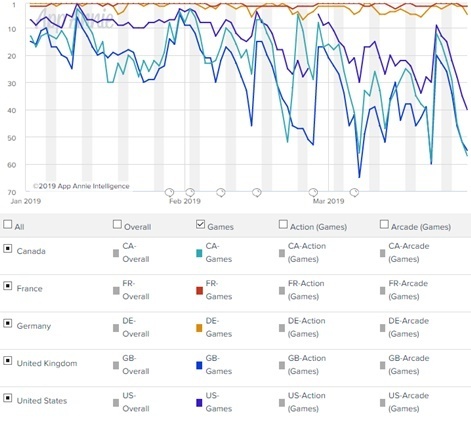 Analysing Google Play top grossing games chart data from App Annie between January 1st and March 28th 2019, we can see that for markets like the UK, Canada and US, Brawl Stars has been on a downward trend this year. It’s still a top 100 grosser in these markets but has spent much of the last month out of the top 50. It’s fared better in France and Germany though, regularly charting as a top 10 and top five grossing title on Google Play. The Brawl Stars story is better on the App Store. The title fluctuates wildly as a top 20 to 50 grosser in the UK over the same period, breaking into the top 10 at times in the US. In both markets, the game’s performance has still steadily dropped. In France meanwhile, Brawl Stars has hopped between first and second place since January and is a constant top 10 earner in Germany, often topping the rankings there. Brawl Stars is hardly the next Clash Royale in key Western markets, but after generating an estimated $150 million in its first three months (as calculated by Sensor Tower), it’s still no slouch. According to App Annie, Brawl Stars’ performance in Asia markets is mixed. In the key Japanese market, on Google Play the title peaked this year at 34th on January 15th, before steadily dropping off to a low of 127th on March 20th, before picking up again inside the top 100. Its performance in Thailand has been on a similar trajectory. In Singapore and Hong Kong meanwhile, Brawl Stars is a top 30 and top 50 grosser. But South Korea is where Brawl Stars’ real Eastern success lies. 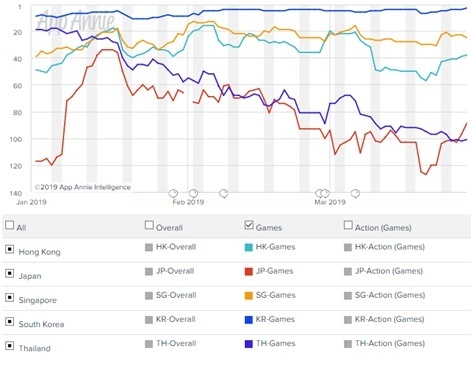 There’s no sign of a drop off in this market - it has consistently shined in the top 10 and since February has been a top-five grosser, recently peaking in third place and is battling it out with heavyweights like Lineage M and Lineage 2 Revolution. Once again, in most cases Brawl Stars fares better on the App Store grossing charts than on Google Play. Brawl Stars has recently fluctuated in and out of the top 50 in Japan, but it's a much better performance than falling outside the top 100 on Google Play. 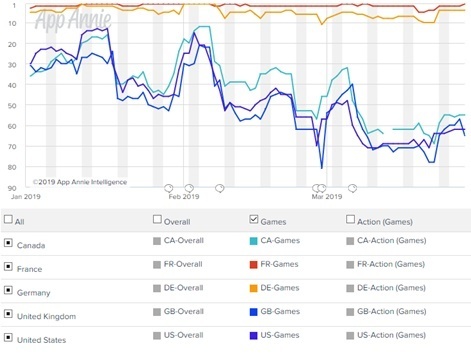 It peaked at a one-off ninth place on January 12th, but again the game appears to be on the decline, albeit with some regular jumps up the chart. Brawl Stars is a top 40/50 performer in Hong Kong, while in Singapore the game regularly features in the top 20 and even top 10. Thailand’s ranking fluctuates greatly meanwhile, dropping from the top 60 to outside the top 100. Once again, however, South Korea is proving a strong market for Supercell’s shooter. It’s a consistent top 10 grosser and has occasionally peaked in the top five and second place spots since January. It’s tough to say with any degree of certainty that, based on its performance in Asia thus far, whether Brawl Stars will really hit the ground running in China. Each key market: Japan, South Korea and China, differ greatly. But Brawl Stars has managed to replicate its Western performance in the East when it comes to chart positioning and its strong showing in South Korea is undoubtedly a very lucrative one. 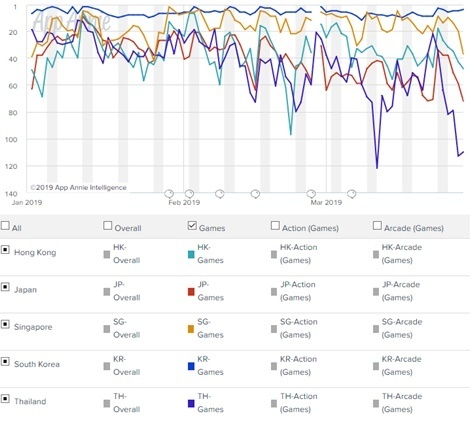 Sensor Tower has previously labelled it the game's second-highest grossing country behind the US, and it even began making more money in South Korea during February than any other region. 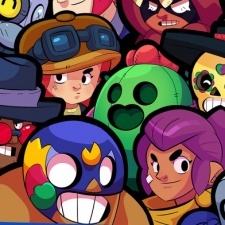 With a strong marketing push and the backing of Tencent in China, Brawl Stars could perhaps be fast-tracked to a billion dollars once it’s given the greenlight by Chinese authorities for release. Learn more about the Asia games markets on our East Meets West track at Pocket Gamer Connects Seattle on May 13th to 14th. You can head to the region itself for Pocket Gamer Connects Hong Kong on July 17th to 18th.